So for lunch today, I made whole wheat pasta with some homemade, nut-free pesto (you can find the recipe here). 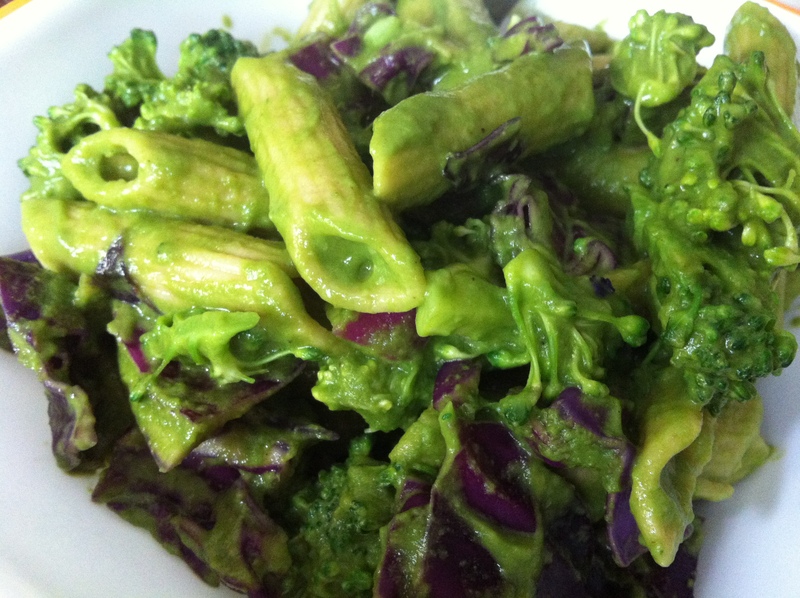 I added some vegetables (broccoli and red cabbage) to the pasta, which tasted really good with the creamy pesto. The blend of spices was really tasteful, but you may want to add more or less salt and pepper according to your own taste. I hope you enjoy! Feel free to throw in your own choice of vegetables or even just eat the pasta with the pesto alone. 1. To make the homemade pesto, click here. 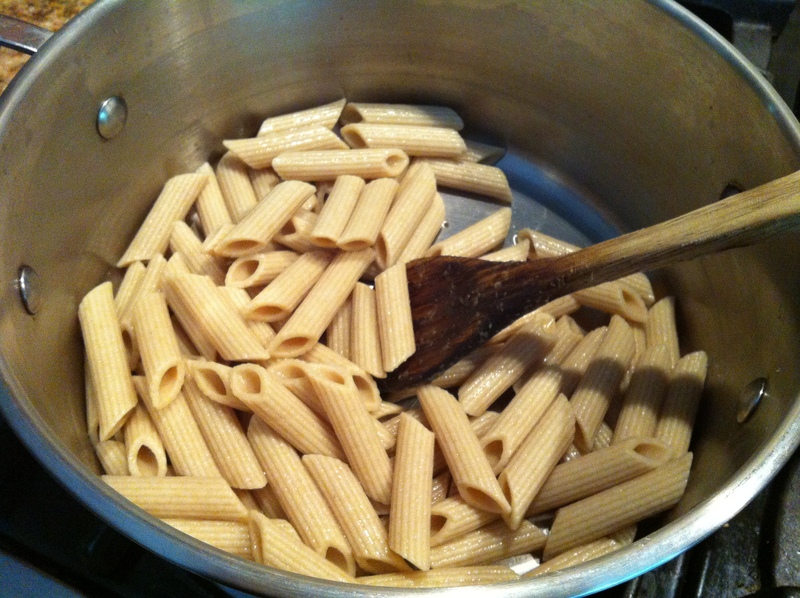 In the meantime, cook your pasta with twice the amount of water in a pot. 2. 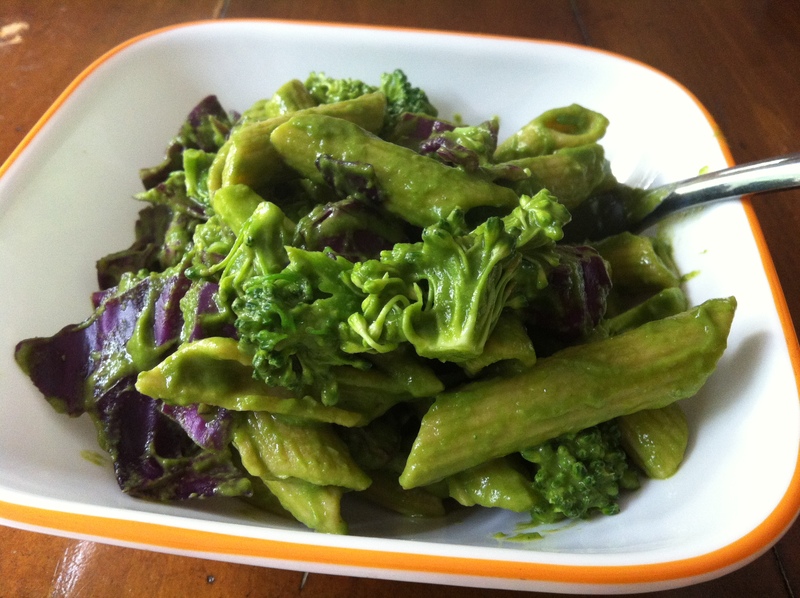 Pour in the pesto and toss in the broccoli and cabbage. Mix everything together and cook with your splash of spices. 3. Serve warm once the broccoli and cabbage are cooked. Feel free to add and remove spices depending on your taste! I liked cooking the pasta with only lemon juice, olive oil, cumin seeds, and garlic and onion powders. My mom liked to add some more salt and pepper – so, like I said, feel free to play around with those spices! 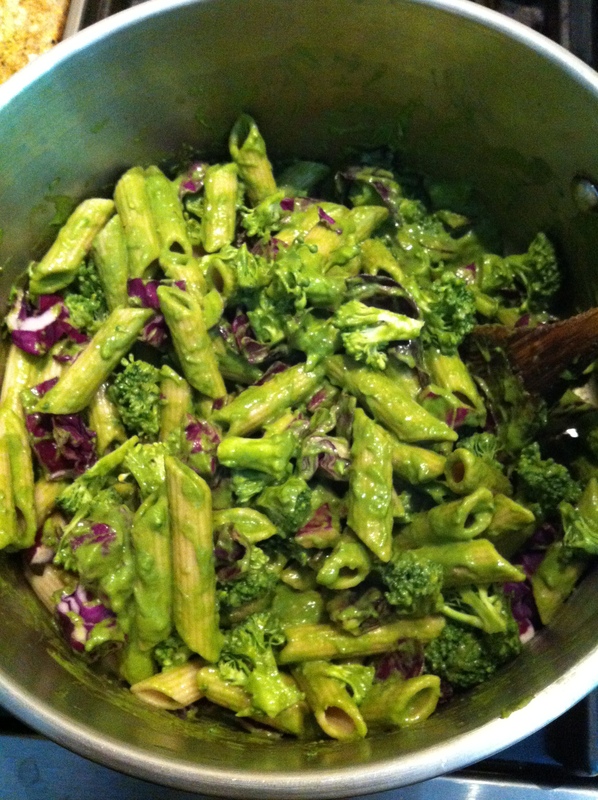 So for lunch today, I’m making an avocado spinach pesto whole wheat pasta dish for my family. I thought maybe you guys would want to know how I made the pesto sauce because it is absolutely delicious and in-fact, nut-free because my brother is allergic to almost all nuts. So this is perfect for those of you who are as well! If you aren’t, feel free to add in the pine nuts (as indicated below) to the recipe, but the recipe alone will satisfy your tastebuds!If you haven’t noticed already, I really really love avocados. Yes, they are high in fat, but healthy fat so I never feel guilty eating them. They taste good with almost anything, honestly. I have them in salads, in rice bowls, in pasta sauces, etc. It’s such a delicious fruit that provides a great source of MUFAs. I highly recommend trying to eat avocados a few days a week, especially as a replacement to all the trans and saturated fat that you may or may not have in your diet! 1. Add all of the ingredients and spices into a food processor or blender. 2. Blend together until smooth and store in an airtight container. 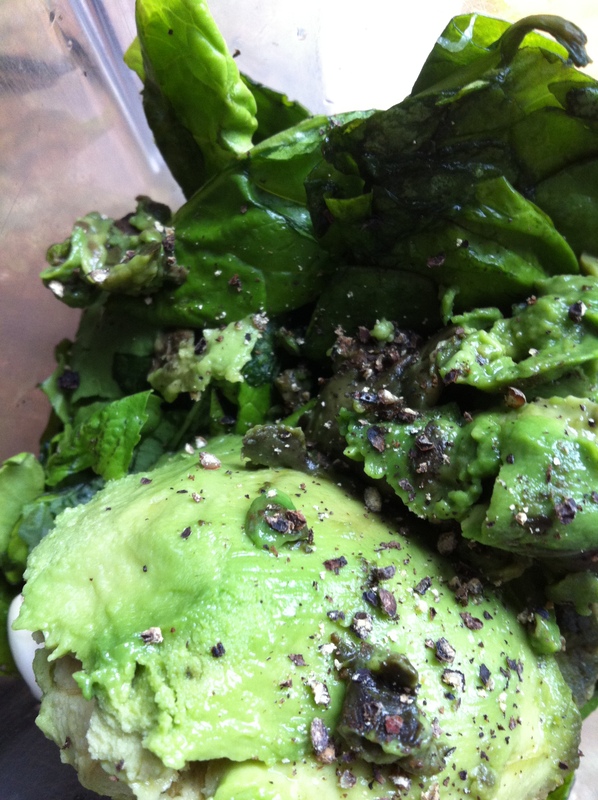 Depending on how ripe your avocado was, the pesto will stay fresh for a few days. I used mine immediately so simply scooped it out of the blender to make pasta! Ahhh so yesterday, I was craving something made from avocado but I didn’t want my typical guacamole so I decided to get a little creative with an avocado spread. I opened up my fridge and took out some random ingredients that I thought tasted good with avocado and played around with them. 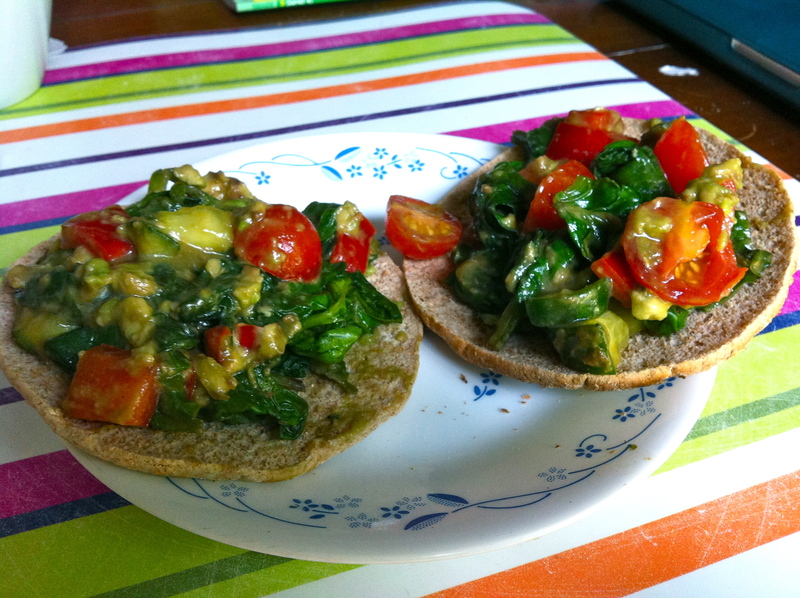 I ended up making this avocado spinach salsa spread that was both creamy and crunchy, and altogether very savory. I ate it on two slices of Arnold’s 100% Whole Wheat Bread, and this morning, enjoyed a spoonful alone. 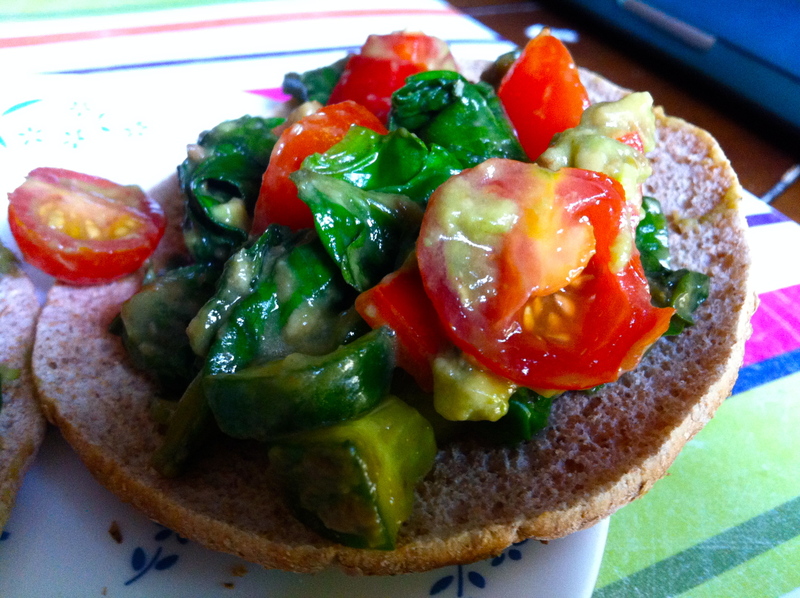 It was really delicious – a new version to a typical guacamole. It’s definitely something different so try it out, and let me know what you think! You can use this recipe as a spread, sauce, side dish, or a snack because I personally think it can be eaten alone or with something else like chips, bread, pasta, rice, etc. 1. Cook your spinach and bell peppers for a few minutes. I simply steamed them on the stovetop with a saucepan and some water. 2. 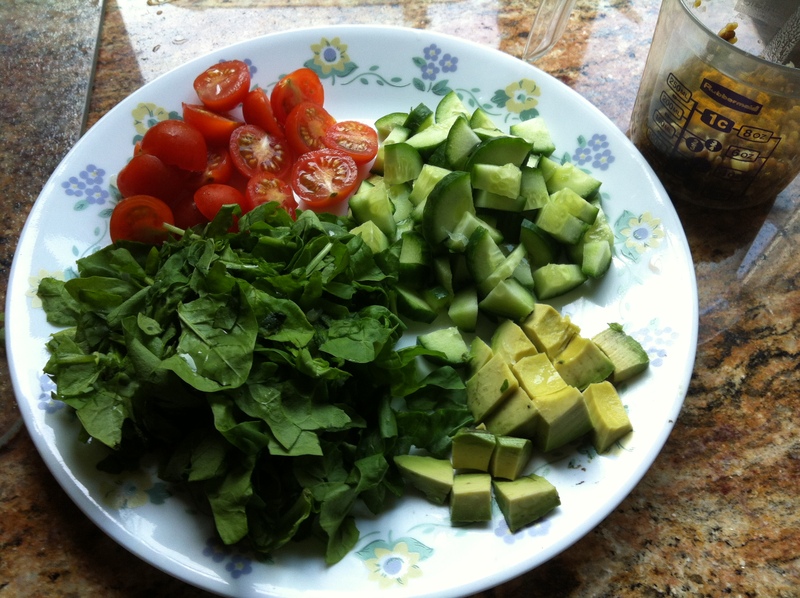 Place the tomatoes, avocado, and cooked spinach and bell peppers into a bowl. Sprinkle in the spices and the lemon juice. Mix everything together. Continue to mix until the spread becomes the consistency of guacamole. 3. The spread will last only one-two days because the avocado will turn black so I made the spread for 2 servings. 4. Enjoy on crackers, bread, as salad dressings (cut the tomatoes finer if you want it as a dressing), or even alone! For dinner today, I was really craving something with tofu. 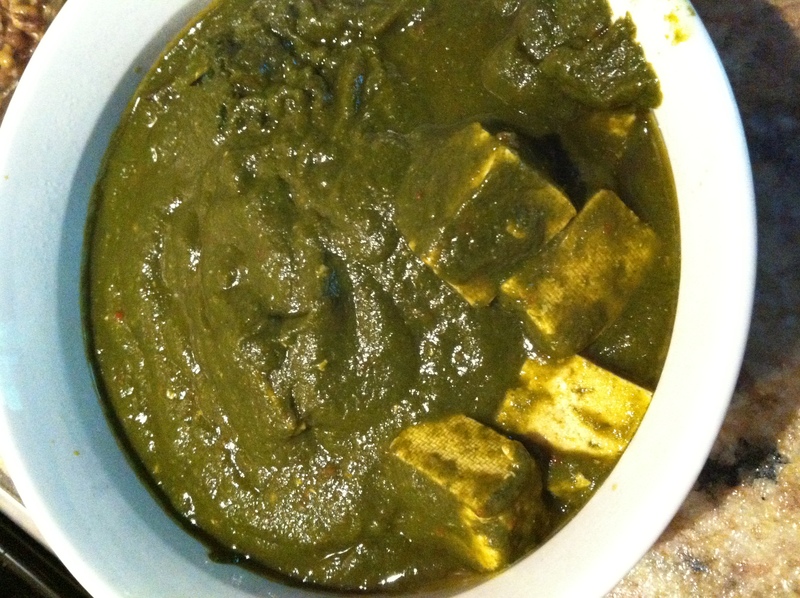 Well, there is this DELICIOUS indian dish called Palak Paneer which is basically a blend of spices, spinach, and chunks of paneer. It was my childhood favorite and now my siblings love it. Paneer, for those of you who don’t know what that is, is chunks of cheese that looks just like tofu. Well, to make this dish vegan, my mom and I transformed the classic Indian dish. We used grains to make the spinach blend more hearty and healthy and used tofu instead of paneer. It tasted just as good and, in fact, is healthier – can’t go wrong in a situation like that!! 1. Blend together the spinach, quinoa, onion, tomato, red pepper, and garlic cloves. 2. Pour the blended “paste” into a pot and heat. Sprinkle in all of your spices and stir. 3. Cut your tofu or paneer into cubes and put into the pot. 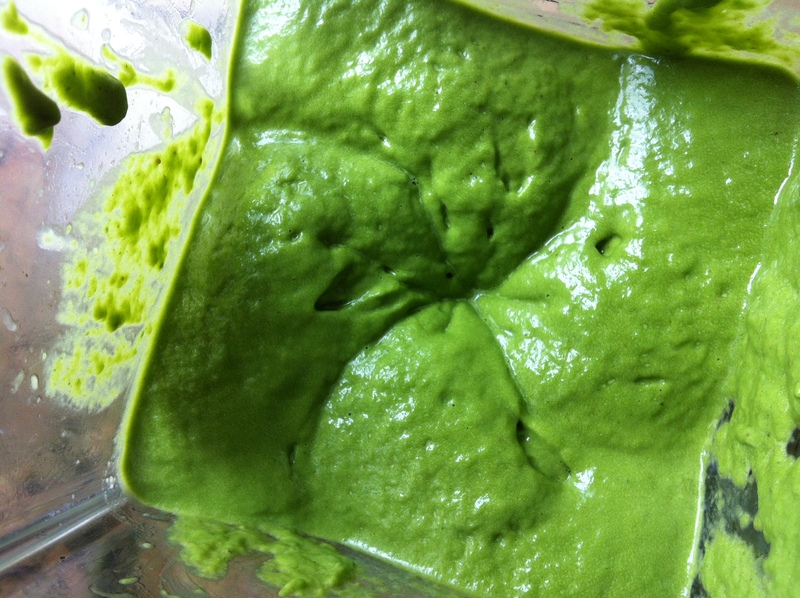 Let the spinach “paste” bubble a little to indicate that it is all cooking. The dish should end up more thicker than watery – that is when you know it is done. 1. Wash and cut all the vegetables carefully. 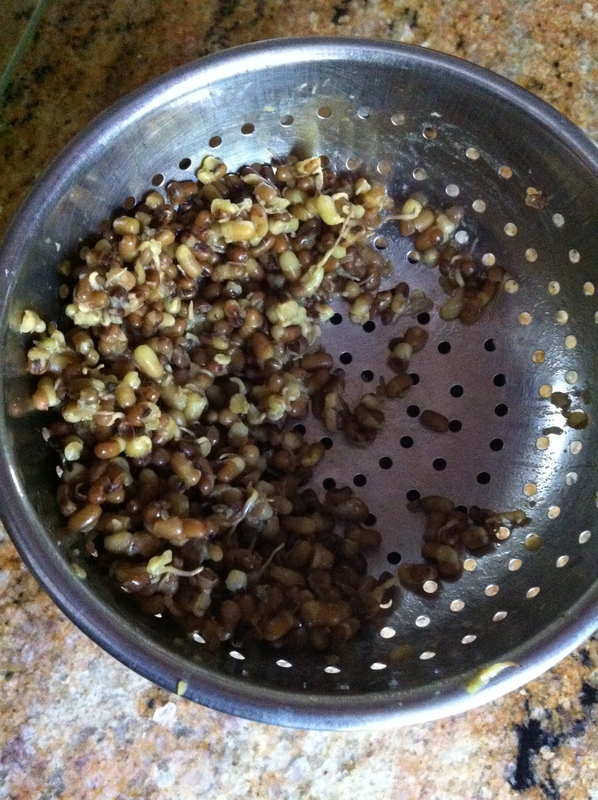 On the side, cook the sprouted moth beans if you aren’t looking for a completely raw salad. To learn how to sprout moth beans, click here. 2. 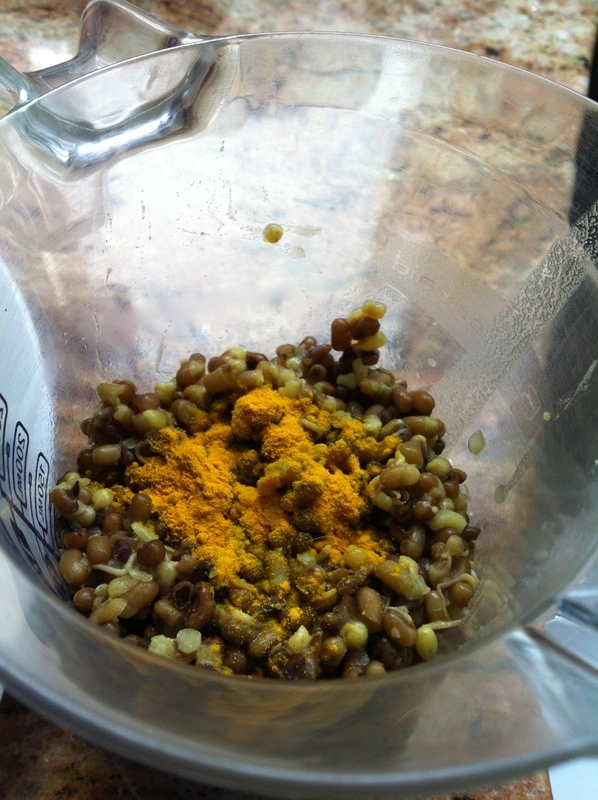 Sprinkle the moth beans with turmeric powder and drizzle all of the salad toppings with your lemon juice. You can add a little salt if your tastebuds need it. 3. Once all the ingredients are ready, layer the salad by placing the sprouted moth beans first, then the spinach, followed by the tomatoes and cucumbers, and finally the avocado. 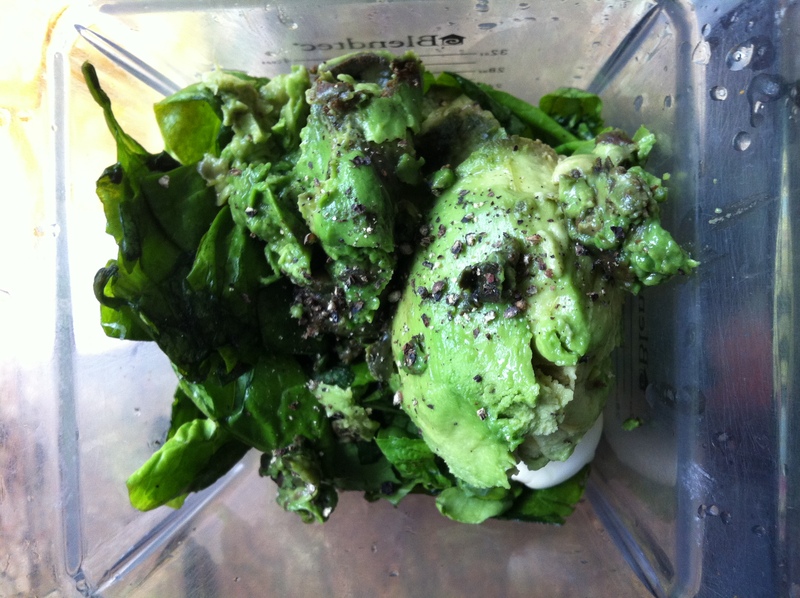 Shake/mix up the salad as you wish to mix all of the ingredients together and enjoy! I’m working in the city this summer and instead of torturing my stomach with city food everyday, I make lunch and my snacks from home and take them with me. Today, I made a lentil protein salad that is full of healthy combination of carbohydrates from the lentils, protein from the eggs, vitamins and antioxidants from the vegetables, MUFAs from the avocado, and a dash of sweetness with the fresh strawberries. 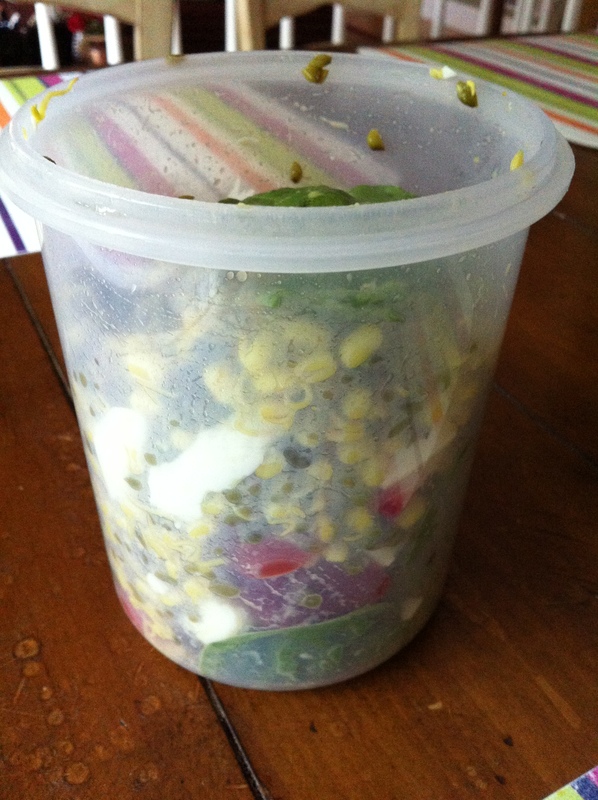 This lentil salad only took me ten minutes to toss together and its so easy to take on-the-go in an air tight plastic container like above. 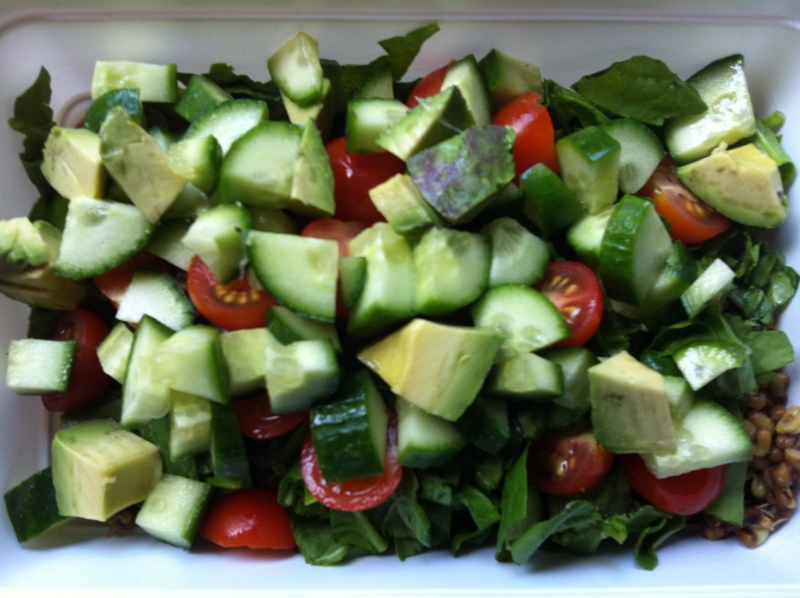 Yummm, who knew salads could be so tasty and healthy at the same time!